Two Dwellings + the Epic Giveaway! Today I wanted to introduce you to the first two blog friends on my special Dwelling book launch blog tour! They each bring something unique and wonderful to their Dwellings and into the world of home blogging. If you haven’t yet entered the epic giveaway we have going on this week, start here and then come back here for additional entries! Visiting each of the following blogs I’m about to introduce you to can give you two more entries into the giveaway (plus give you major inspiration! ), so read on! Marian is one of the friends I met earlier on in my blogging life. She’s the author and creator of the blog Miss Mustard Seed. Her creativity in so many areas will blow your mind, she’s an entrepreneur, a painter, an artist, an author and more. You can find Marian’s artwork, paint line and products plus her newest book The Home Design Doodle Book on her website here. I love following her blog. She is completely refreshing a 13 year old home right now and giving each space her signature look (and doing so much of it herself!)! 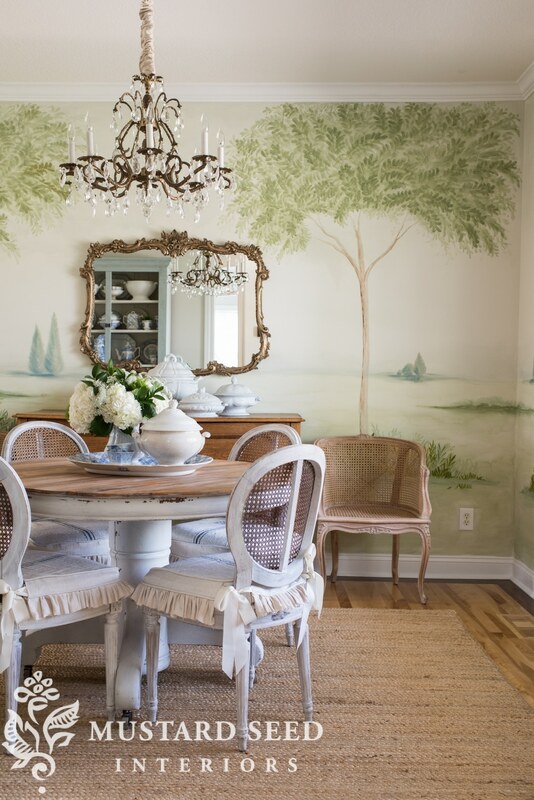 Marian even painted her own mural on her dining room wall (see it above). Hello, so gorgeous, right? To read Marian’s post about Dwelling and get another entry into my epic book launch giveaway, head to Miss Mustard Seed and leave a comment on her post! I’m also excited to introduce you to my sweet friend, Becky of Clean Mama. She is a talented entrepreneur and author. I have to say, even though she is so down to earth, she is still the ultimate housekeeper! I want to be her when I grow up. She has a great perspective on keeping her home and is a wealth of knowledge, so I know you’ll love her. She offers tips on how to clean everything (I learn so much from following her blog!) 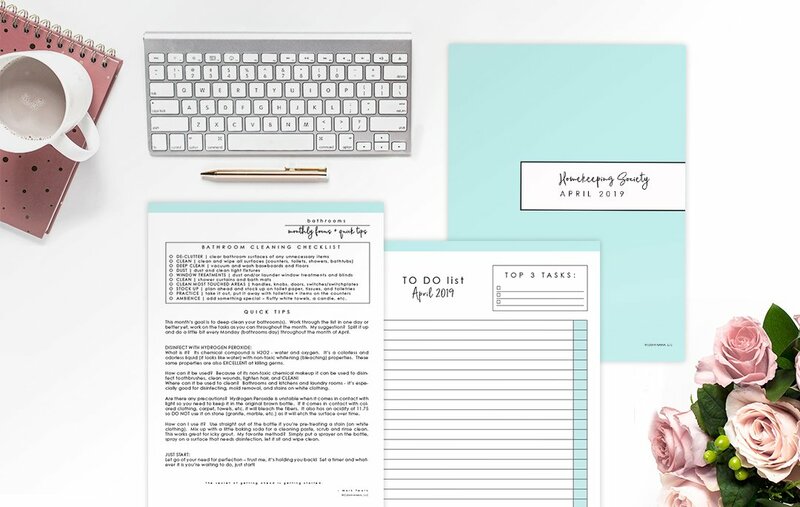 and helpful printable worksheets to help you stay on task (grab her FREE April homekeeping calendar here). You can find her wonderful housekeeping books here, including her newest book Clean Mama’s Guide to a Healthy Home (featuring lots of research and information on toxins in the home, too!). She also runs the Homekeeping Society, a monthly subscription service to help you feel on top of all of your home tasks! You can find more details on how to join here (use coupon code 50OFFAPRIL for 50% off your first month). Head on over to read Becky’s post about Dwelling (and her life in her cozy home as a kindred homebody!!) on Clean Mama leave a comment on that post to get another entry into the epic Dwelling book launch giveaway! ORDER YOUR COPY OF MY BRAND NEW BOOK, DWELLING, HERE! This is great especially this tree on the wall. I am a homebody and love the focus on feel well where you dwell. I am inspired. I love the links to the other blogs, a great idea to introduce some wonderful ideas. Cant wait for the new book! I am a homebody for sure! I love my home but need inspiration to spend more time keeping it clean. Thanks for sharing this great information. I find that in creating a lovely home, keeping it clean goes hand in hand for it to really shine. It’s just so satisfying! 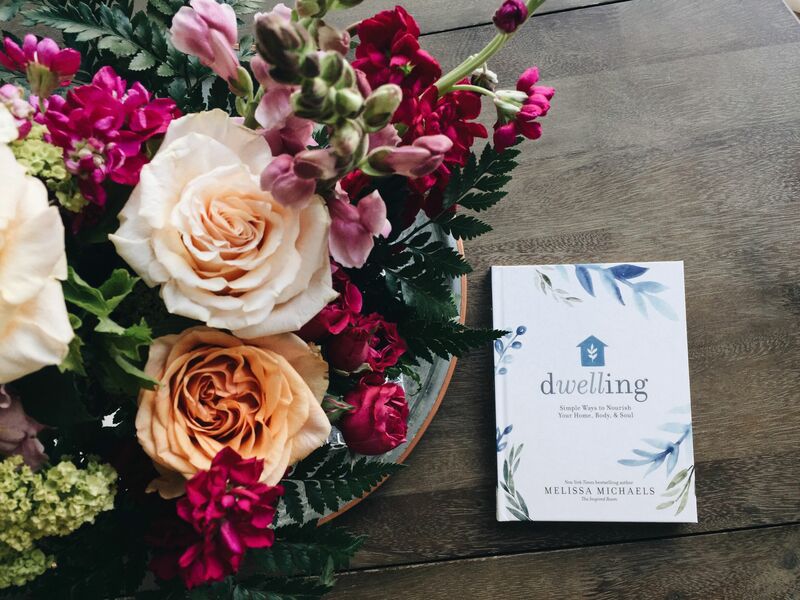 I’m so enjoying your new book “Dwelling” is spot on with aligning you and your heart’s desire to create a life and a home that is the best version of you. Thank you, Pamela! It means a lot to me that you came to comment today, thank you for reading Dwelling!! I think the answer is they weren’t designed to be or considered a set, even though they are all written by me. (I think that would be cool, and it’s possible some day that they’d be repackaged in that way, but that isn’t how they were designed — on purpose. It’s wonderful when people buy all of my books, I love that! And as a collector I’d love to see them all match in a unified stack too! Maybe someday! Oh my goodness, I love everything you have done with her room, the wallpaper is such a gorgeous addition!